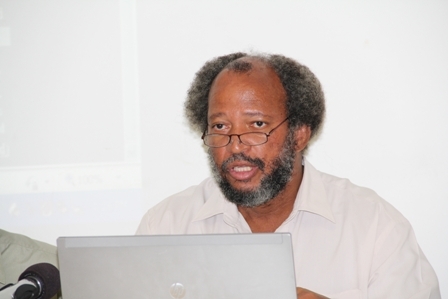 NIA-CHARLESTOWN NEVIS (June 01, 2011) — Director of the Nevis Disaster Management Department on Nevis Mr. Lester Blackett announced on Tuesday that predictions for the 2011 Atlantic Hurricane season suggest it would be extremely busy and urged the Nevis public to take note and all necessary precautions in readiness for the season. Mr. Blackett was at the time addressing local media at a press briefing at the Llewellyn Newton Disaster Management Facility. The six-month season which commenced on Wednesday June 01 and ends on November 30th and according to Mr. Blackett, the forecast called for well above average activity with an above average probability for a major hurricane landfall in the Caribbean. “We are looking at the reports about nine hurricanes the average is 5.9; 16 named storms the average is 9.6; 80 named storm days the average is 49.1 so well over the average almost twice the average; 35 hurricane days the average is 24.5; five major hurricanes the average is 2.3 so more than double and 10 major hurricane days the average is 5.0 that’s double. “This is obviously an estimate based on all the technology and the scientific advice that’s there. Sometimes they carry it up sometimes they bring it down but this is what we are facing this year and as such this is part of the reason why it is important that everybody from the child to the adult from the family to the business place be serious about disaster preparedness not for hurricanes alone but floods, earthquakes and even manmade hazards,” he said. Mr. Blackett noted that the season would usually heat up around the month of August but for this season forecasters have predicted an early start. However, he said the list of emergency shelters throughout the island were at present being inspected by personnel from the Public Works Department but a full report was expected by Thursday. It would only be after the report the official list would be made immediately available to the public through local media publications, both print and electronic. According to the United States National Oceanic and Atmospheric Administration (NOAA), the names for the 2011 hurricanes are – Arlene, Bret, Cindy, Don, Emily, Franklin, Gert, Harvey, Irene, Jose, Katia, Lee, Maria, Nate, Ophelia, Philippe, Rina, Sean, Tammy, Vince and Whitney. In the meantime, the public has been urged to continue their preparedness efforts in earnest.